How does one begin to describe one of the best experiences of their life? It simply cannot be described in one word or one sentence, but the experience & memories taken from my trip to the London 2012 olympics will live on forever. I departed for the London Olympic Games on Saturday the 28th July, after having watched the Opening ceremony the previous evening at home with family. If the Opening ceremony was anything to go by, I knew that I was to expect one of the most incredible Olympics to date. If there’s one thing the British are good for, its organisation, creativity, and most definitely ‘thinking out the box’. On arrival in London, you were hit with an array of Olympic signs, posters, banners, flags, information centers, volunteer workers and an overall sense of Olympic pride & excitement, but what I was about to experience at the Olympic Park, I could not have expected. When it comes to such a grand event such as the Olympics, I don’t think a person could go there with any expectations or ideas of what it would be like. I certainly did not know what to expect or how things in the Olympic Park would run. 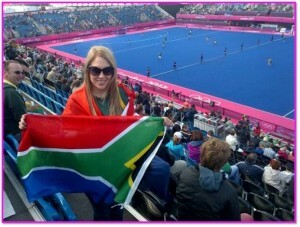 The first time I traveled to the park was on Monday, the 30th July, to watch the first South African Men’s Hockey game against Australia. Everybody entered into the park via one entrance, which was accessible from West Ham station, but the main station used throughout the Olympics was Stratford Station which had been organised and controlled so effectively to ensure a smooth flow of the thousands of people who came and went via this station. 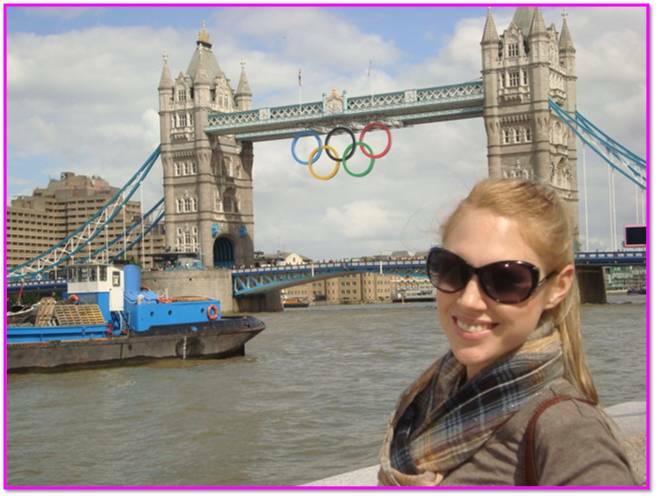 Everybody that went to the Olympics will remember Stratford as the starting point of their incredible journey! It was about a 10 minute walk from the station to the main entrance where tickets were checked and every single person had to go through ‘airport’ type security which included heat scanners, metal detectors, bag scans, and inspections. No liquids were allowed into the park. All security checks were done by the thousands of army force that came in to assist, and I cannot fault them on anything. They were extremely polite, helpful, kind and overall did such an amazing job, for as little as £12 an hour (±R156). There were hundreds of security points and you never waited longer than 5 minutes to be helped. As you entered the park, you caught your very first glimpse of the Olympic athletic stadium, in all its glory, staring you in the face, enticing you forward. What better way to enter and set the tone for the Olympic Park. Next to the stadium was the Aquatics centre, where you would constantly hear cheering. Another site, was the Orbit, a mechanically built lift, with artistic features, that took you to a top viewing platform in order to catch a view of the entire park. 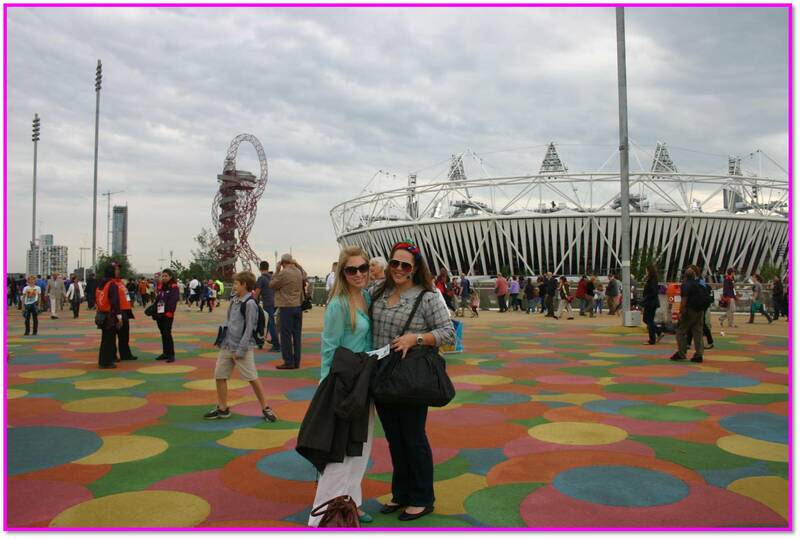 The colour scheme for the Olympics was a bright pink, which could be seen everywhere! There was never a moment where a person felt lost, as there were thousands of bright pink signs and direction posts and not to mention the many volunteers that helped out. Within every 100m you would pass at least 5 volunteers helping out, giving direction, providing information to the crowds. Not only were they situated in the park, but at every single tube station, bus stops, and train stations. No matter where you were in London, you were be able to stop and ask an Olympic volunteer for help. Each volunteer received a special Olympic 2012 Adidas track suit, personalised London 2012 Adidas sneakers, an Olympics Swatch watch, a bag, water bottle and anything else they needed while on duty. Each and everyone of them deserves a medal for their outstanding work and effort and for always being approachable and friendly. If you looked at a map, you would see that the stadiums/arenas were quite far apart in this chosen designated area North East of London. The London Olympic team created an incredible masterpiece. They surrounding and cornered off this entire area and literally created a huge theme park. There was one main walkway from beginning to end, and along the way you got to absorb each and every stadium from the Basketball Arena, to the Velodrome, to the BMX arena, to the Water Polo centre, all the way to the Riverbank Arena where the hockey took place. It was a 25 minute walk from the entrance to Riverbank Arena, and on the odd occasion when running late, I found myself running from the entrance through the masses to get to Riverbank on time for the start of the game. Not all events took place in the park. 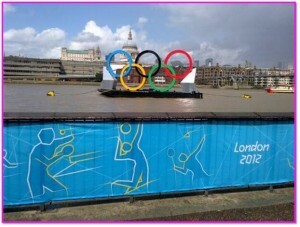 For example, the rowing was held in Hyde Park, the Volleyball in St James park. No matter where it was, you had to possess a ticket to watch, and adhere by all the rules. 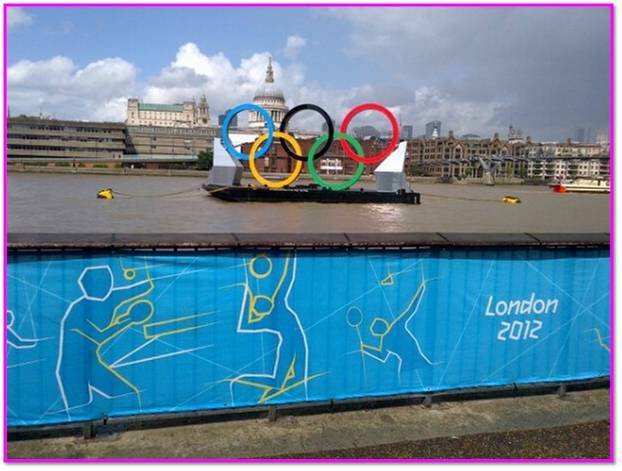 The Olympic Committee cleverly used high profile tourist attractions along the marathons/cycling/walking routes. Along the route, viewing was open to the public and was fantastically supported by the locals. Each arena had their own ticket/security check, where tickets were scanned and you could enter. In the Olympic park, there was also a constructed BBC building, which overlooked the athletics stadium, where all the BBC breakfast interviews and news would take place. As MacDonalds was the official food sponsor of the 2012 Olympics, it was only fit that there was a gigantic MacDonalds restaurant, which provided over 40 service counters, was double storey, and had an outside dining area. There were also a number of other food stalls and snack bars available throughout the park. The Olympic Park adopted a recycle “go green” attitude and provided so many different dustbins for all the different items in order to be recycled. There was never a paper seen on the floor, nor was there ever a queue that lasted longer than 5 minutes. The grand store in the Olympic Park was the 2012 Olympic Shop, which everyone wanted a piece of! I cannot even describe how large it was but there were thousands of people in there at once. The queue was constantly flowing, people were constantly entering and the packets and packets of goods and Olympic items were seen constantly leaving. I too am guilty of splurging in the store, but once you were in there, you were bound to spend money as the goods and items were just too good to surpass. From t-shirts, to mugs, to jackets, to pins, to key rings, books, magnets, wallets, paper-weights, trivial pursuit games, flags, teddy bears, shopping bags, baby clothes, Olympic jewelry, hats to everything imaginable! It was there!! 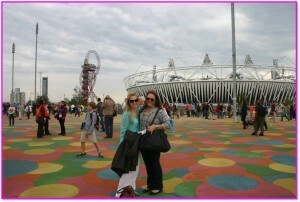 I cannot fault the Olympic Park, as it was absolutely unbelievable and so well organised. It was the small detail that added that special edge. Something like the water fountain that as the water fell into the river, it spelt out different words like “London, China, Russia” etc. The Olympic rings located in the park and around London. There was also an ongoing presence of security, police on horses, police patrolling on foot, but not to the point where you thought that there were too many of them. It was a job well done, and when the Olympics is over and done with, they intend on using the park as a recreational area and turning the Olympic Village into blocks of flats for the public, providing over 2000 new homes for families. Most of the Arena’s were constructed in such a manner that they can easily be disassembled. 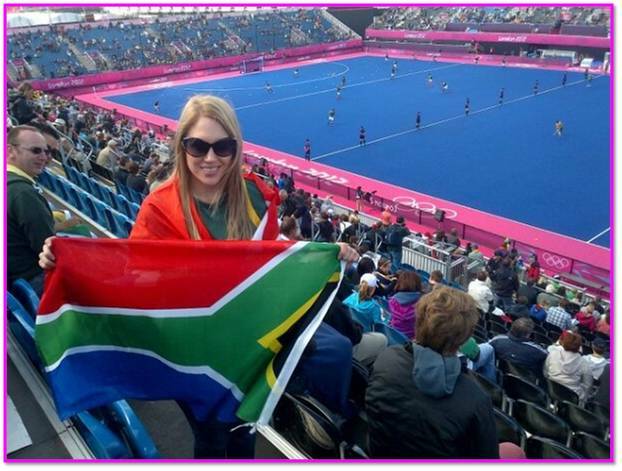 I have had the privilege of doing some volunteer work for the South African Men’s Hockey team for the past 2 years and managed to get tickets to watch all 5 of their pools games against the respective teams. 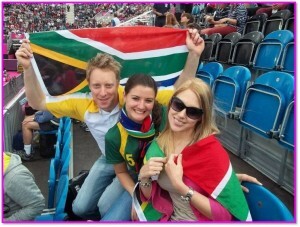 Its incredible to sit in a crowd of over 16 000 people and spot the South African flags and supporters. From a crowd perspective we looked few and far between, but when the fans, friends & families of the team got together after each game you were truly able to see just how many supporters South Africa had. 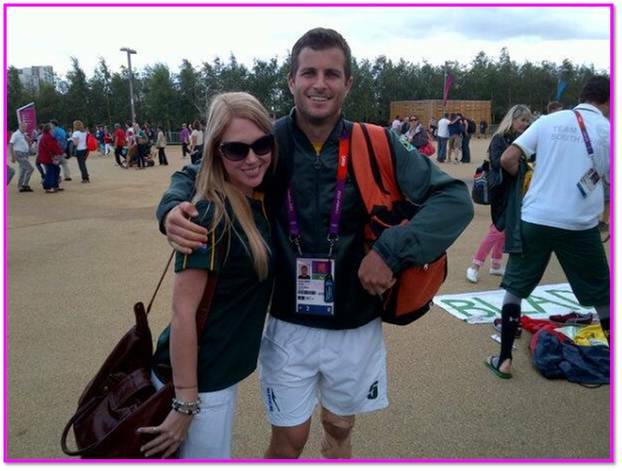 The men played every second day, so I was lucky enough to go to the Olympic Park 6 times and experience the incredible vibe. On the off days, we went into London and did a few of the touristy things and explored all that we could. I was lucky enough to have my sister, Kerryn, with me on this trip, so we indulged in all of London’s sites and specialties. Big Ben, Parliament, Tour of Buckingham Palace, St Pauls, Covent Gardens, Picadilly Circus, Leicester Square, Hyde Park, Chelsea Football Stadium, Wimbledon, Tower Bridge, Harrods, South African Olympic House, Italian Olympic House, and the Tower of London were just a few of the sites and scenes we absorbed! After the Olympics we traveled down to the coast, Seaford for a bit of R&R before traveling back home. Unfortunately our Hockey Men didn’t do as well as we had originally planned, but the mere fact that they managed to get to the Olympics despite all the politics and hardships, was an achievement in itself. Our first game took place against Australia, who are ranked in the Top 5 in the world, with SA ranked 12th. We knew that game was our toughest and honestly didn’t put too much pressure on ourselves for losing 6-0. It was an improvement from the last time we played Aus which resulted in a 10-0 loss. Our second game was one of the most exciting games I have ever witnessed, purely because the vibe and atmosphere against the Great Britain team was electric. The crowds sang, cheered, chanted, clapped and created one of the most “WOW” moments in my life. South Africa scored their first goal in this game and that had me up on my feet cheering and screaming too. It ended in a 2-2 draw, and needless to say, the Brits were stunned! SA had them, and given 5 more minutes were bound to take the game (well that’s my opinion anyway). On the Friday, we took on Spain, and again just couldn’t finish off the game. The following game saw the SA Hockey Lads lose narrowly to Pakistan after being 2-0 up in the first half! Last but not least, SA vs Argentina, which again just didn’t end the way we wanted it to. One can only commend the SA hockey Men on their efforts, and I know from personal experience from working with the team, that coming 11th at the London Olympics was definitely not a true reflection of their worth and potential. It’s times like these that you really see how much sport in our country needs help and attention. You cannot expect a team to claim gold when they have no funding and can only get together a month prior to the Olympics. Needless to say, I am so proud of the SA hockey Men and what they accomplished! There were many ups & downs, but when in the right mind set, these boys can achieve the unachievable! 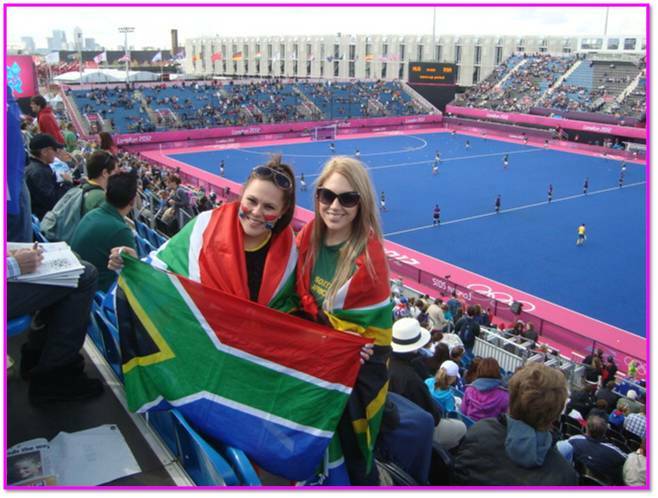 I also had the opportunity of watching a South African Womans Hockey game, where they narrowly lost to Japan in a nail-biting finish. They lost in golden-goal, which is 15 minutes of added play, and who ever scores first, wins! They most certainly put up a good fight. Sadly, I did not have the opportunity of watching any other Olympic events purely due to the fact that the tickets to events were absolutely impossible to come by. If there is one negative I take away from the whole experience, it is that of the Olympic ticketing system! South Africans could not buy on the Olympic website and had to buy from a local distributor who was only selling 3-day packages and no singular tickets. What I eventually did was got friends, who stay in the UK, to set up an Olympic account and allow me to access it in order to buy tickets. I had attempted to get tickets for over 9months, and would check the website constantly, everyday. Tickets were released at random, and remained online for a period of about 20minutes max, sometimes 10 minutes went by and the tickets were gone. All expensive tickets were released for sale first, which ranged from £150-£115. The cheapest Opening ceremony tickets I found went for over £1000 (R13 000). It was a constant struggle to try and get tickets, and I luckily managed to get for all of the South African Men’s Hockey pool games. Each ticket was valid for a session which meant you were able to watch 2 hockey games, one from pool A and the other pool B, so I was lucky to have witnessed the New Zealand Black sticks, Belgium, India, and many more. A person was not allowed into the park without a ticket which meant that ALL tickets were to be bought online, but how could a person buy online when they weren’t available or for sale? It was said that 20 000 tickets were released every night during the games, and I for one tried countless times to get tickets online, to no avail. It was impossible. It was a dream of mine to watch Rhythmic Gymnastics, Athletics and Synchronised Swimming, but could just not get tickets! Even the orbit which was open everyday, all day. Tickets for the Orbit were sold in sessions, so if you knew that you had tickets for a hockey game tomorrow from 8:30am, chances that you could get a ticket to go on the Orbit on that day were simply impossible. After a while, and countless attempts, I was incredibly disappointed and frustrated with the ticketing system and gave up trying. However, I refused to let that put a damper on my trip and soaked up every bit of the Olympic Park as much I could. It’s incredible being able to walk around and spot athletes from all over the world, and see different people come together for such a great cause. 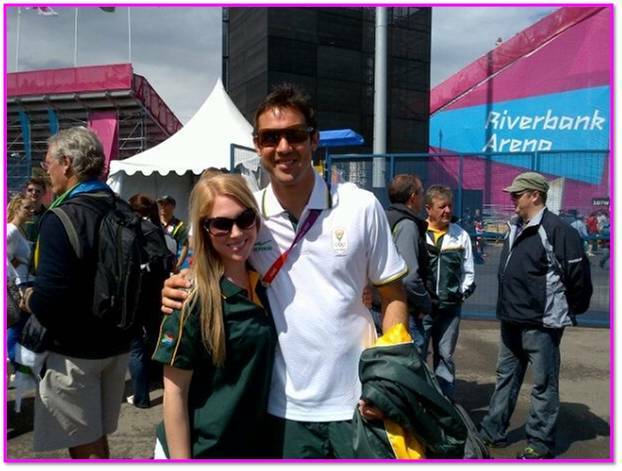 The athletes would gladly stop for autographs and to have pictures taken with fans. I even bumped into a few American athletes on the tube and had a wonderful chat with them, only to spot them on TV a few days later. According to an article I read in a British newspaper, the monetary worth and value of the Olympic Medals was £445 for Gold, £225 for Silver and £3 for bronze. The gold medal was only 1.8% real gold. Overall, it was an experience of a lifetime, and I am incredibly grateful for the opportunity and for being able to tick something off of my bucket list! Sport plays an important part of my life as I grew up playing it, actively involved in it, learnt about it, studied it, and sought a career in it. It’s moments like the London Olympics where you see hands on, just how much sport plays an important role in the world and how athletes push themselves to be the best, better than they’ve ever been before. Its inspiring and certainly taught me valuable life lessons. London, you were amazing! Even the weather played its part!Thank you! Rio, 2016, I’m there… Who’s joining me? ?